I’ll be at three thrilling events in the near future. If you’re nearby, come check it/them out! The Hanover Book Festival — Saturday, April 27, 10 a.m. to 2 p.m. at the Richmond Times-Dispatch Building in Mechanicsville, Virginia. Come meet a bunch of Virginia authors! Hayfield Comic Con — Saturday, May 4, 10 a.m. to 4 p.m. at Hayfield Secondary School in Alexandria, Virginia. The students are organizing this event, and they’ve got some fun events lined up, including an Escape Room. Plus, this will be an excellent place to celebrate Free Comic Book Day! GalaxyCon Richmond — May 31 to June 2 at the Richmond Convention Center. I will truly be a very small fish in a huge pond here, but I will have a table, so come say hello! This entry was posted in Uncategorized on April 21, 2019 by drsherrier. The Flying Woman came out about five months ago now, and thank you to all who read it, are reading it, or will read it. In the meantime, I’ve been hard at work on the sequel. I’m not nearly done yet. I’ve got maybe two-thirds of the first draft written, and I have the rest plotted out, but plenty of work remains ahead. More details on The Silver Stranger will follow in the coming months. For now, if you’ve read and enjoyed The Flying Woman, please tell your friends, and that will help The Silver Stranger materialize faster. I always appreciate everyone’s support. This entry was posted in Terrific, The Flying Woman, The Silver Stranger on March 23, 2019 by drsherrier. Giveaway ends December 19, 2018. 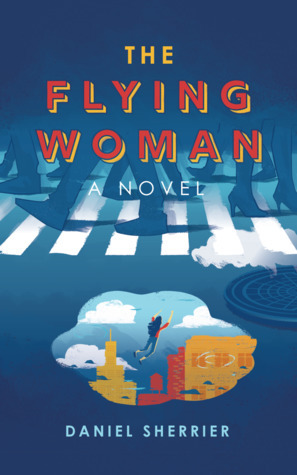 It’s the season of giving, so I’m giving Kindle copies of The Flying Woman to 100 readers in my first-ever Goodreads Giveaway. Click the above link to enter. Thank you to all who show an interest, and I hope everyone enjoys the book. This entry was posted in Terrific, The Flying Woman and tagged Goodreads on December 2, 2018 by drsherrier. Below is the official press release for The Flying Woman. Check it out, and then mosey on over to Amazon and add the book to your Goodreads shelf. Nov. 28, 2018 – How do you act like the perfect person when you know full well you’re nowhere near perfect? That’s the question at the core of “The Flying Woman,” a new superhero novel by Daniel Sherrier. In “The Flying Woman,” the impossible has become reality. A masked man possesses extraordinary powers, and he’s using those fantastic abilities to fight crime and pursue justice. Meanwhile, Miranda Thomas expects to fail at the only thing she ever wanted to do: become a famous star of the stage and screen. This entry was posted in Terrific, The Flying Woman on November 29, 2018 by drsherrier. How do you act like a perfect person when you know full well you’re not? This entry was posted in Terrific, The Flying Woman on October 21, 2018 by drsherrier.